There is an invader amongst us, and it goes by the name of Platydemus manokwari. Better known as the New Guinea flatworm, this alien aggressor is a natural predator with no known local enemies. It dines on a variety of soil dwelling inhabitants such as snails, slugs and other beneficial invertebrates. The first sightings of this invader were in 2015 in the Miami metro area and Coral Gables–both of which were the first discoveries ever made of this flatworm in the United States! Adult flatworms survive in pots or on plants and are transported by humans via soil, compost, rooted and potted plants and landscape waste. Not only are they an invasive species that can cause real environmental damage, but they also are known to carry a parasite called rat lungworm that can cause a form of meningitis in humans. Besides that, this flatworm produces toxic secretions that may trigger an allergic reaction in some people. There have already been 18 different confirmed observations in Indian River County since the fall of 2017. So how can you identify one? These flatworms absolutely adore humidity and can be found in coastal, forest, urban and wetland environments. Homeowners typically find flatworms in potted plants and moist areas of their landscapes such as found under mulch or in leaf litter. They are dark brown to black with a grey/tan underbelly and a faint stripe down its backside. Adults of this species can range anywhere from 1.5-2.5 inches long and if that was not enough to induce nightmares they are also nocturnal predators and can reproduce on their own without a mate! What do you do if you find a New Guinea flatworm? First and foremost, if you spot one of these foreign creatures DO NOT TOUCH them with your bare hands. Always protect your skin from coming in contact with the flatworm and any of its secretions by using gloves or a plastic bag. Nevertheless, do not let these slow-moving slimes scare you; a few simple steps can be taken to fight back against this nightmarish invader. The most effective method of extermination is the “hot water treatment” which will kill the New Guinea flatworm but reduce casualties of the native soil dwelling animals we are trying to protect. 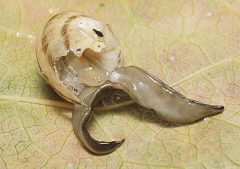 Research has shown that pouring 109.4 degrees Fahrenheit (43 degrees Centigrade) water over the flatworm is hot enough to kill it, but snails and ants will survive. 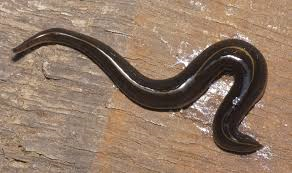 Other effective ways to kill these flatworms is to drop them into a container with alcohol, or put them in the freezer overnight and then dispose of them in the garbage. 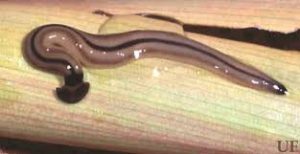 If you do spot the New Guinea flatworm, take a clear picture and communicate your discovery to Florida Fish and Wildlife Conservation Commission by phone: 888-483-4681 or on their website at IveGot1.org. You can also help track these invasive flatworms by reporting your sightings with the Early Detection & Distribution Mapping System at www.eddmaps.org/florida/report or, to find out if they have been seen in your area check out this Distribution Map. Chances are the flatworms found in most Florida gardens are non-toxic species such as Bipalium kewense, which is shown left. The New Guinea flatworm’s stripe, as shown on the right, is lighter. With a Masters in Agronomy from UFL, Christine is most at home on the range.